An awesome combination of machine and hand-built trail, technical features, small hills, beautiful lakes and creeks! This is a rapidly evolving trail system. There is currently a 10-mile loop around the lakes or a 9-mile loop on the east side of the park, depending on which route you take. There is also a 2-mile loop across the road from the parking lot. Some segments of this trail will have a notably different character from others, so it definitely doesn't feel like you are riding the same trail for miles on end. There are still a few segments of trail using old hardscramble/dirtbike trail, but most of the trails have been recently built within the past 6 years. There are also some of the biggest sized technical features in the metro area to be found here. The park will continue to be developed with new trail segments added over time. At the trailhead, you'll go through the gate in the fencing, head to the right and the entrance to the trail system is clearly marked. The first part of the trail parallels 90th street and rides fast, eventually heading down a bermed descent, then heads back up through some berms and rollers. After this, you'll be riding on a doubletrack section that goes over a wooden bridge, keep your eye out for other trail users here as this is a two-way trail, also shared with the Wright County hiking trail. After this, you'll emerge into a prairie and start riding some newer trail built late 2014, which eventually winds around "Bald Hill" giving great views when the leaves are down. At various points, you'll have the option to turn back towards the trailhead for a smaller loop. Halfway through the loop, you'll come to a bridge crossing in the NE corner of the park. This is a significant decision point - cross the bridge over the creek to ride all the way around the chain of lakes, or continue riding the trail on the south bank of the creek. The trail after crossing the bridge offers some more open, very flowy and fast trail with bermed corners, eventually turning into a segment of old dirtbike trail, and finally into a blend of newly constructed trail around an esker area and some very old mountain bike singletrack. 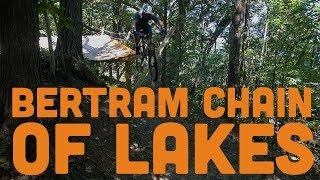 Choosing to stay south of the creek, you'll continue riding some fairly tight, twisty trail with some great views of the creek and lakes. Eventually, this trail turns into a segment of old dirtbike trail that is more open and fast, then into some singletrack through an old Christmas tree farm. There are some good-sized, constructed technical features to be found on this path. There is also a small loop across the dirt road from the trailhead parking lot; simply ride directly across the road and there will be wayfinding posts marking the entrance. This is a self-contained 2-mile loop, which has great flow to it and also has the large "Huck Harbor" trail feature on it. The trail tread at this park is much loamier and softer than nearby trails, combined with the deeper woods this gives it more of a "rugged" feel in comparison. It also drains exceptionally well and is often ready to ride earlier than nearby trails after a rain event. If you are looking for a more rugged ride, this is the trail for you. 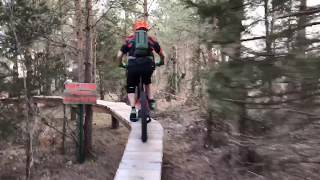 Many people enjoy bringing their fatbike here. Winter riding is allowed (please stay off XC ski trails! ), and a volunteer occasionally grooms the trail. Ride Em All #7 - It's a ride fest today! We looped the first section a couple of times. Great fun! we did one loop around the lakes without doing anything twice and gps said under 8 miles. how did we miss the 13? First time riding Bertram and I really enjoyed it. Love how not busy yet well kept the trails are. Like most of the technical features! Exiting Gravity Cavity with style! Peter sends a log drop at Bertram. Mike on the Step it Up skinny. Crossing the bridges at Bertram. Testing the new Log Drop at the Creek!